West Adams in 1906 was the preferred address for the elite. This home was built for James T. Fitzgerald, the music-store mogul. He hired one of California’s best-known architects, Joseph Cather Newsom to design this showcase home. The home is located at the corner of Adams Blvd. and Arlington Ave. Elegant Manor West Adams Los Angeles CA. Los Angeles landmark home. Living space: 6,665 sq. ft. Lot Area: 9,016 sq. ft.
Joseph Cather Newsom was known for his graceful lines and whimsical styles. Elegant Manor is a 15-room residential home combining Italian Gothic and Queen Anne style. Exterior has curling wooden ornamentation and tranquil gothic arch interior. Huge brick chimney, cellar, attic, octagonal sunken den with fireplace and vaulted ceilings. Newsom style traveled from West Adams to Hancock Park and Beverly Hills, CA. 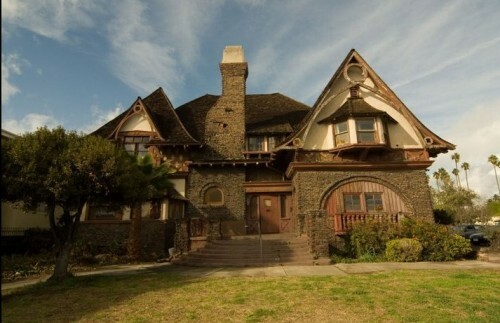 Over time the home was owned by a group of vaudeville and circus performers and served as a rest home for actors. In 1977 it was purchased, Arlillian Moody. Moody turned the home into a community center, dress shop, catering operation and halfway house. While Moody provided catering for the cast of Soul Train. Arlillian died in 2001 and home fell into disrepair. Currently, this once elegant home would be considered a major fixer-upper needs complete renovation. West Adams real estate history. West Adams one hundred years ago was the cat meow. One hundred years ago West Adams was considered a suburb. The automobile allows residences to migrate west. Prestigious neighborhoods extended to Miracle Mile, Windsor Square, Hancock Park and beyond. This home showcases the bygone architecture of the area.